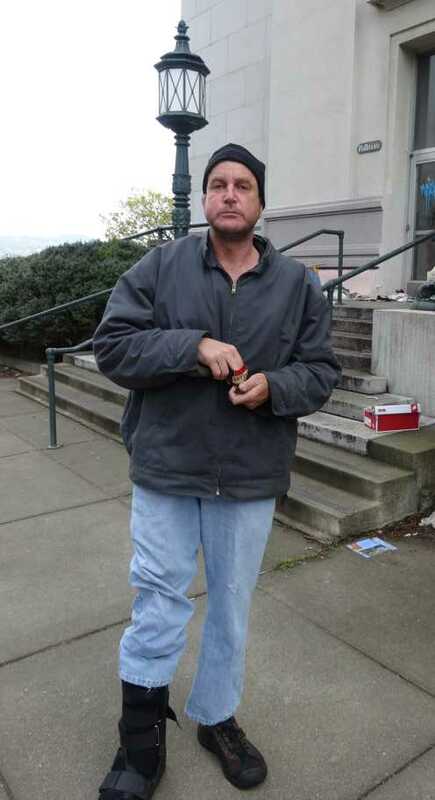 Gavin Ames said he broke his leg on Oakland’s pothole filled Jackson Street. The health problem cost him his job, leading to homelessness. The city forced him to leave his camp site next to the Kaiser Auditorium today and trashed some of his belongings. The city of Oakland ordered several dozen homeless residents to vacate their camp sites around the Henry J. Kaiser Convention Center today. A large crew of public works employees were ordered to dispose of tents, blankets, luggage, and other possessions. At least ten Oakland police officers were on scene also. Scrawled on the sign is a date; “January 28, 2012,” the day hundreds of Oaklanders attempted to take over the Kaiser building as a “community center.” Oakland’s mayor and city council authorized the police to use all means necessary to repel the march. Oakland police fired tear gas, rubber bullets, and threw stun grenades at the protesters. The building has sit empty since then. Seven Oakland police officers chatted among themselves nearby, watching ducks and geese and a stray rooster pecking at the grass. The officers looked bored. “I don’t think they want to be doing this, out here when there’s better things they should be doing,” said Walker. On the other side of the building Gavin Ames is trying to figure out how to move his belongings before the city’s workers throw them away. “I used to be a cashier at a Chevron station. I was living paycheck to paycheck,” said Ames. “Then this happened,” he said, pointing to the cast on his leg and foot. 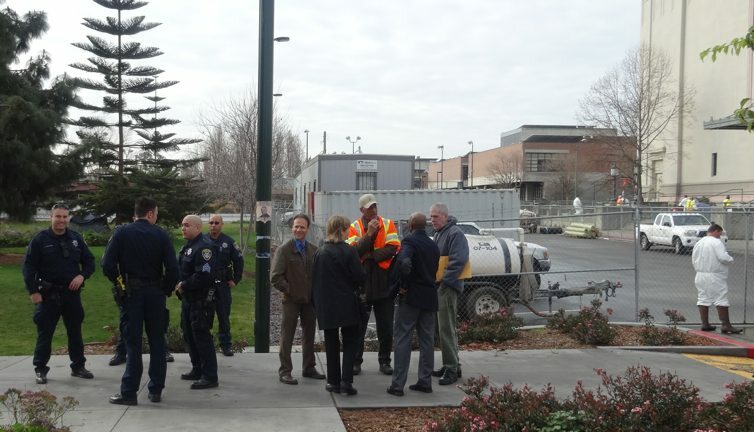 City of Oakland staff, non-profit outreach workers, and Oakland police at the “clean up” of Kaiser Auditorium. Devries mentioned also that last week the building was broken into and copper was stolen. It’s not clear how that related to the homeless persons camped out nearby. Several of the homeless men called it just another excuse to remove them. 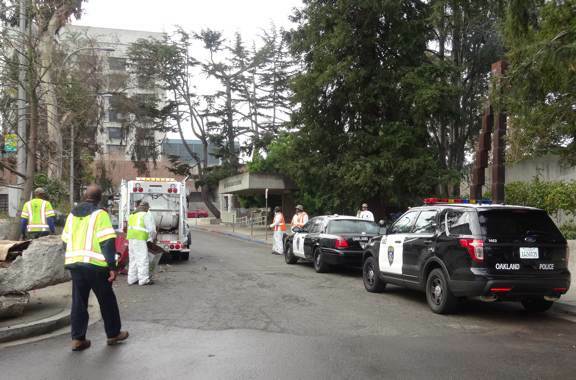 A large number of Oakland police officers watched over a public works crew as they removed a homeless encampment around the Kaiser Auditorium. Among other noteworthy details surrounding William J. Bratton’s new advisory contract with Oakland to beef up the city’s police department are Bratton’s ties to Motorola Solutions. Motorola Solutions is already one of Oakland’s biggest vendors. The company has sold Oakland millions of dollars in equipment over the past ten years, mostly for use by the police. This year alone Motorola will probably bill the city for several million in goods and service. 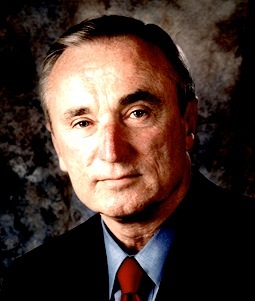 William J. Bratton is currently a board member of Motorola Solutions, as well as a shareholder in the company. While Bratton’s position at Motorola is relatively new, his advocacy of expensive, hi-tech weaponry and systems for cops isn’t. In fact just three years before he joined Motorola, while he was chief of police in Los Angeles, Bratton oversaw approval of multi-million dollar contracts between Motorola Solutions and his police force. As he has shuttled in and out of government posts and private corporations over the years, Bratton has grown into the classic revolving door figure, using his connections and prestige to link corporations with public agencies, playing matchmaker and facilitating lucrative contracts. This is in fact why Motorola tapped Bratton in join their board in 2010. According to a Motorola company filing, “Mr. Bratton’s significant experience in law enforcement both in the U.S. and abroad and his insight in criminal justice system operations,” have qualified him to occupy a seat on the board as an independent director. 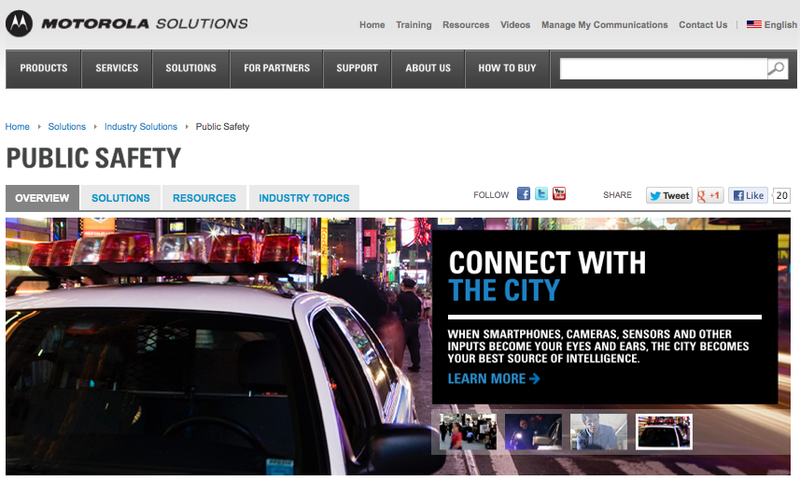 In 2011 Motorola Solutions paid Bratton $100,000 in fees, and another $160,033 in stock awards. Like a lot of police departments, the OPD already does business with Motorola Solutions, a lot of it. One of Oakland’s single largest contracts is an $8.45 million deal with Motorola for a suite of computer and mobile communications gadgets known as the Integrated Public Safety Services System, or IPSS. According to City Council reports from 2002 in addition to the $8.45 million to purchase the IPSS, the city also approved spending an additional $5.25 million on a five year maintenance contract also with Motorola, and another $3 million for “non-recurring costs for products and services,” related to the IPSS. 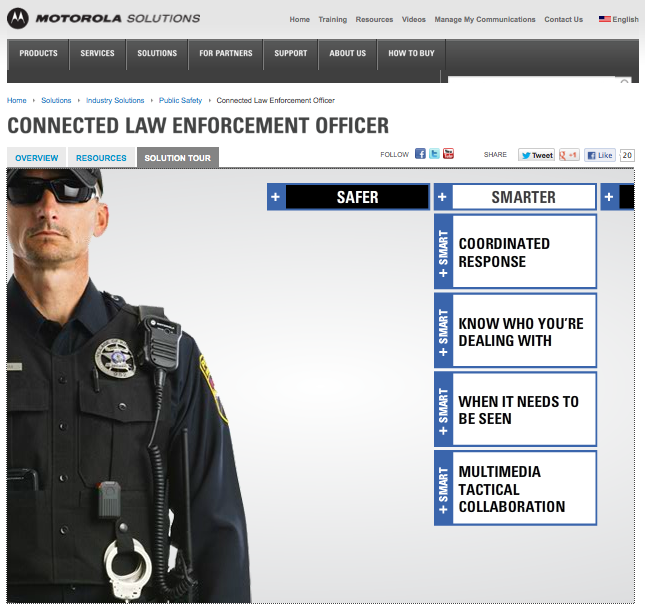 A screenshot from Motorola Solutions’ web site. The company is one of the largest vendors of communications and surveillance equipment to police forces in the United States. A little background on how Motorola got the Oakland contract can help to shed some light on the big business that is police technology. 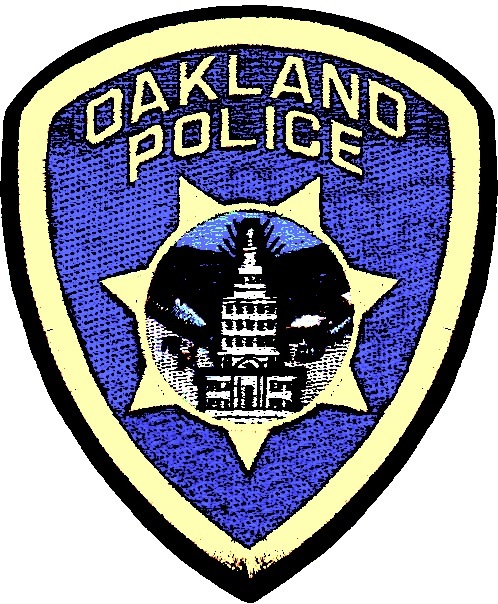 In 1998 Oakland was awarded a $6.18 million federal grant, aptly named “COPS MORE”, to equip the force with state of the art communications and computing tools. By 2001 the city was preparing to put contracts out to bid for technology companies to develop a Computer Aided Dispatch (CAD) system, Records Management System (RMS), Automated (Field) Reporting System (FRS) and a Jail Management System (JMS) for Oakland’s police. In 2010 and 2011, the last years for which information is available, Oakland spent $2.88 million on the IPSS maintenance, a cost that will likely continue so long as Motorola’s system provides the city with its data and communications integration for the police department (“2009-11 Proposed Policy Budget” City of Oakland, p. Y-79). Another business deal with Motorola went completely haywire and was a small setback in OPD’s efforts to comply with the federal consent decree. In 2007 Oakland spent at least $65,000 on a software program called Evalis from a company named CRISNet. The purchase was meant to provide another technological solution to the department’s continuing inability to comply with the federal consent decree stemming from officer abuses and departmental incompetence. Evalis was a database that was to be used to identify “at-risk behavior activities” of officers, meaning it was a way for OPD to pinpoint bad cops with particularly egregious records of brutality, civil rights violations, and other criminal tendencies. Just like with the IPSS system that was being developed by a small independent company, Motorola swooped in late in the game and bought out CRISNet, making that company’s contract with Oakland now Motorola’s. Then Motorola Solutions turned around and demanded more money from Oakland than was agreed to previously with CRISNet. Motorola claimed the Evalis system would be expensive to integrate into the company’s own product suites. Oakland balked and cancelled the contract, choosing to develop a system based on the existing Evalis software in place, using the city’s own technical staff. The City Auditor’s Office, which analyzed the Evalis fiasco in a report last year, was not amused; “Regardless, the result is that OPD lost at least $65,000 on the Evalis system.” OPD claimed, however, that it was Motorola’s fault, and the cops had a point. In a press release responding to the City Auditor OPD stated, “the system was not used because Motorola bought Evalis after our purchase and its support of Evalis was cost prohibitive.” In other words, Motorola Solutions was trying to squeeze more money from Oakland. 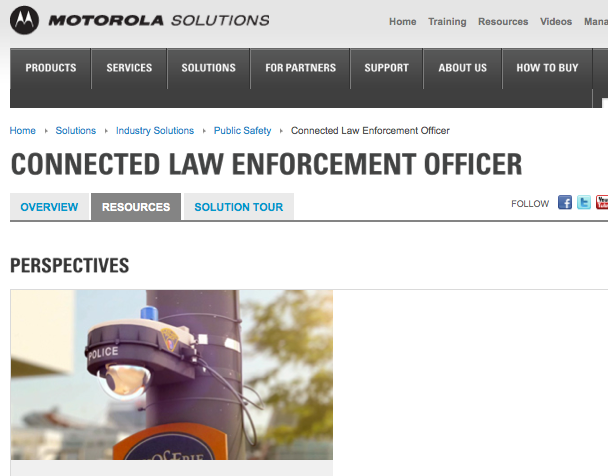 Motorola Solutions sells the “connected law enforcement officer,” from a screenshot of the company’s web site. Motorola has other business with the city, more police gadgets and software, all of which is supposed to bring OPD into the 21st Century and help the department comply with the federal court’s orders. Between 2005-2007 Oakland also paid Motorola $40,000 to provide technical support for the police radio system. Motorola also sold Oakland 63 hand held Jaguar radios and in-vehicle equipment used with these radios for a total price of $140,000 (“Proposed Policy Budget FY2005-07,” City of Oakland, pp. D-191 and D-193). Bratton, a supposed “super-cop” who is widely perceived as having modernized and professionalized the LAPD and NYPD, has over the last decade emerged as a proponent of various hi-tech police gadgets and systems.This is partly why Motorola Solutions has given him a board position and stock in the company. Having built a reputation as a police disciplinarian during the mid-1990s when he ran the NYPD, Bratton began selling his expertise to any police agency willing to pay for it. Bratton created his own consultancy in 2000, the Bratton Group, LLC, and contracted with police forces in the US and “four continents,” according to his official biography. Shortly into his lucrative career as a private consultant Bratton joined Kroll Inc.’s Public Services Safety Group and Crisis and Consulting Management Group, eventually becoming Chairman of Kroll until it was purchased by Altegrity. In a way Kroll got Bratton his job with the LAPD. Bratton was part of the Independent Monitor’s team overseeing that city’s consent decree. Motorola also sells a lot of goods to Bratton’s other former police employer, the NYPD. In fact Motorola employs no less than twelve lobbyists to influence how New York’s officials spend their billions of taxpayer dollars on radios, computers, cameras, and other police technology. Just to give you a sense of how big a can of worms Motorola has become, Bratton is hardly the most politically connected ex-government figure on the board. Fellow board member Michael Hayden ran the CIA from 2006 to 2009, and prior to being head spook of the USA he ran the National Security Agency, all after spending a career in the Air Force. Needless to say, Motorola Solutions isn’t just tapping police departments through Bratton’s prestige and connections for future business, they’re also selling a lot of widgets to the military and federal spy agencies. But this is all another story…. 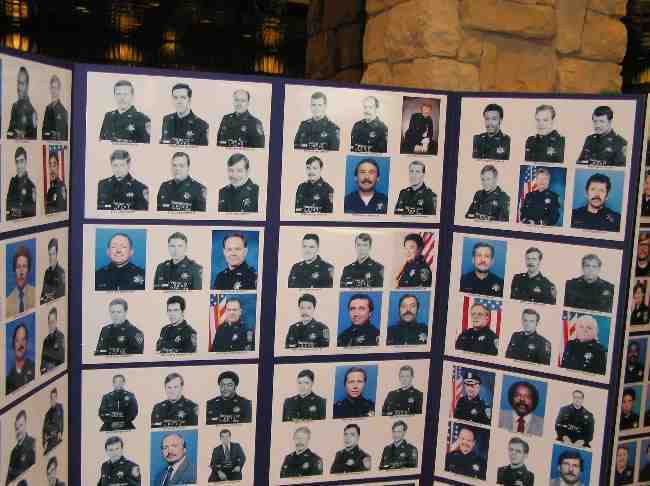 OPD “mug shots” displayed during a department reunion held in Reno, Nevada in 2005. Many of the shots are of officers employed in the 1970s and 1980s, hired before the PFRS pension system was closed to new members. OPD’s cops from that era were mostly white men. I’ve been working on an article over the last two weeks about Oakland’s much talked about, but little understood Police and Fire Retirement System (PFRS). Fiscal conservatives constantly cry that the sky is falling, that the PFRS obligation to Oakland’s retired public safety employees will bankrupt the city, especially because of the massive issuance of pension obligation bonds used by Oakland to finance legally required contributions since 1997. These conservative commentators are mistaken, I think. The underfunding of the PFRS is certainly a problem, but not for the reasons they say. I’m interested in re-framing the discussion about PFRS, away from the anti-tax, anti-government rhetoric that has so far monopolized things, and toward what I see as the real problem with PFRS: Oakland has a billion dollar obligation to 1,000 retired cops and fire employees who served between 1951-1976, virtually all of whom are white and elderly. Oakland’s police department (and fire dept.) was characterized by overt racist exclusion of non-whites from employment during this era, thus the lucrative benefits of the PFRS pension were made accessible to white city employees. This select club of men (and yes a few women and a handful of Black, Latino, and Asian members) now predominantly live in retirement enclaves outside the city of Oakland. These communities have much different demographics than Oakland, being much whiter, more affluent, suburban and rural, but they benefit from the pension payments that go to the PFRS members who live and shop within their jurisdictions and tax districts. The PFRS obligation therefore amounts to a $1 billion obligation of Oakland, which today is 2/3 non-white and half below the age of 36. To meet these obligations Oakland’s leaders have put the city into serious debt, and in some prior years even paid millions out of its general fund budget, dollars that could have been spent on services for the city’s residents, or salaries of current employees. This legacy municipal pension obligation is therefore a massive inter-racial and inter-generational transfer of wealth. Here’s the abstract of the article. I’ll post a full draft version with references soon. In 1976 the city of Oakland, California closed its existing municipal pension funds to new members. New city employers were thereafter covered by the rapidly growing California Public Employees Retirement System. The Police and Fire Retirement System (PFRS), by far Oakland’s largest pension, remained an obligation of the city, however. It’s thousands of vested members retired over the next several decades drawing benefits tied to the salaries of current members of the police and fire departments. Between roughly 1950 and the present, de-industrialization, white flight, and the tax rebellion decimated Oakland’s fiscal capacity, causing the city’s services to decline dramatically in quality and availability. Beginning in the 1970s the PFRS endowment began to fall short of accrued actuarial liabilities. To meet its legally imposed debt to the pension, the city was forced to pay into the retirement fund out of its general budget, further harming current city residents by imposing austere budgets and cuts during economic downturns. In 1985 Oakland issued the first ever pension obligation bonds (POBs) to forward-fund the system through a complicated tax arbitrage strategy. The federal government quickly closed this loophole, but POBs remained a favored strategy for the city to finance its legacy pension obligations because they provided contributions “holidays” and were supposed to reduce the overall financial burden on the city caused by its retired cops and firefighters. Subsequent recessions in equities markets further eroded the value of the PFRS system in relation to its growing obligations to retired police and fire employees. By the 2000s a significant chunk of Oakland’s tax-override funds were used to pay retired police and fire benefits, even while the city was forced further to cut much needed services, social welfare spending, and economic development programs. Because of institutionally racist policies, and demographic shifts after World War II, the majority of the retired city employees benefitting from the PFRS fund are elderly white men who live outside of Oakland, while Oakland’s population has become majority non-white, young, and low-income. The PFRS obligation of Oakland now amounts to a large racial and inter-generational transfer of wealth from the city’s current residents to a very small suburban and rural group of former employees. OPD’s Outside Legal Costs Are Down in FY 2011-2012; But is It Progress? My own scan of the city’s legal settlement payouts related to police misconduct show a different, higher figure. Police misconduct leading to legal settlements forced Oakland to forfeit $4.668 million last year. The difference in accounting between the City Attorney’s and my own estimate is probably due to the fact that they’re not counting two $1.2 million payouts last year into trust accounts managed by lawyers James Chanin and John Burris, money related to the Riders settlement from almost a decade ago. It’s a fair exclusion since these are not settlements from the current year, but it doesn’t give a full accounting of how much OPD officer misconduct cost Oakland last year. If one adds other costs associated with federal oversight of OPD by the court appointed monitor Police Performance Solutions, legal defense of OPD officers by outside firms such as Rains Lucia Stern and Burnham Brown, investigations into officer misconduct by independent law firms such as Renne Sloan Holtzman Sakai, and special investigations such as that carried out by the Frazier Group, as well as smaller numerous legal expenses related to employment law, arbitration, and court reporting, the total for outside legal costs paid by OPD last year was $7,161,598. Among other notable things about OPD’s legal expenses last year was that the Frazier Group came in about $9,000 under budget in producing their comprehensive report detailing OPD’s numerous institutional problems. The report will only prove to be a valuable bargain if city leaders implement its many recommendations, however. While OPD’s legal expenses may be down this year after having spiked in FY 2010-2011, it is very likely that costs will spike again in future years due to numerous recent cases of alleged police violence, false arrests, and clear violations of the department’s own policies and procedures, with many of these violations having been recorded and broadcasts over the Internet during the Occupy Oakland street demonstrations of late 2011 and early 2012.